Mutahi Ngunyi is clearly wrong for accusing Kenya's Prime Minister, Hon. Raila Odinga of abandoning the quest for social change. When Dr. Babafemi Adesina Badejo wrote that Raila Odinga is an enigma in Kenyan politics, there was swift laudatory reaction and obvious indignation from different quarters. This is perhaps because many, including distinguished political scientists and commentators, missed the point altogether. Highly publicised events involving Raila in the past few days prove Mutahi wrong and confirm that Raila is indeed a political mystery to many in Kenya. After the Madaraka Day celebrations on June 1, Raila avoided political chit chat and the well manicured lawns of Statehouse for the serrated benches at the City Stadium. He joined football fans to watch the Madaraka Day Cup contest between Gor Mahia and AFC Leopards. He joined the fans again on June 7 and 14 at Nyayo Stadium to watch the World Cup/Africa Cup of Nations qualifier matches between Harambee Stars and Guinea and Zimbabwe respectively. While addressing the African Economic Forum in Johannesburg, South Africa, the Prime Minister termed as criminal, President Robert Mugabe’s stranglehold on power,something which many African political leaders cannot dare express. Though Raila later clarified that those were his personal sentiments (to avoid a diplomatic row with Harare) the message had already sunk home. On June 9, he was at it again. While President Kibaki joined the business mandarins and financial capital moguls to launch the trading of Safaricom shares at the Nairobi Stock Exchange, Raila chose to take a humble meal of fish and ugali at a downtown joint patronised by ordinary folk. Whether by design or coincidence, his act clearly stole the show from the major event of the day in Sub-Saharan Africa, the launch of trading in Safaricom shares. The president could have mollified thousands of small time local investors who feel disenchanted by the manner in which Safaricom shares were allotted, leaving them indebted, but that did not happen. Raila appeals to the innate instincts of the common folk. He has proved that he is a master in the art of socio-political imagery and symbolism. When my former college-mate and Assistant Minister for Health, Hon Danson Buya Mungatana mimics Raila’s “political football” antics to make fun at political rallies, he misses the point. My other college-mate and MP for Budalangi, Hon Ababu Namwamba misses the point too when he takes on Raila in his quest for a grand opposition coalition. That Raila chooses to ignore rather than shoot them down only serves to emphasize their political dwarfism and magnify his political mystique in Kenya. Like the ancient sages of Rome, Raila knows when to go to the people and when to let the people come to him. He knows when, how and where to touch base and connect with the ordinary people. It is a fate few of his political contemporaries can match. Because of his flair to interconnect with ordinary folk, Raila has the ability to excite the masses, turn simple functions into memorable events and elicit a near-cult following. It is this skill that gives him the leverage to tread where angels fear to tread and take serious political risks. In politics, just as in war, you win some battles and lose others. Choosing the battles to fight and those to avoid is a mark of skill and ingenuity on the part of a general. Withdrawal too is tactic of war, and a good general knows which battles to fight and when to make a tactical retreat. Contrary to Ngunyi’s assertion, the Right Hon. Raila Odinga has not abandoned the fight for social reform; he has merely made a tactical withdrawal for the moment. 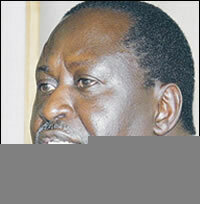 It is my guess that even if he abandoned ODM for another outfit, Raila would still be assured of his intact following.